Amerisleep AS4 Mattress Review - Made For Side Sleepers? 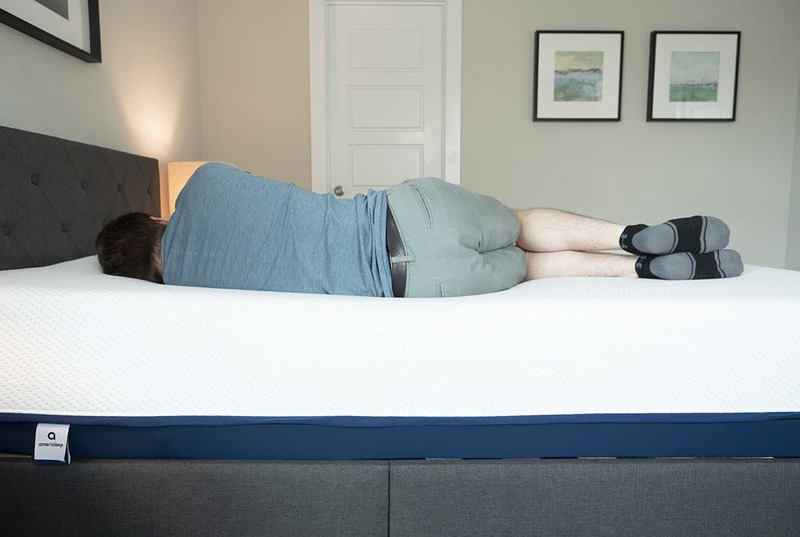 Home » Amerisleep AS4 Mattress Review – Made For Side Sleepers? Amerisleep AS4 Mattress Review – Made For Side Sleepers? Amerisleep has five options in their line of memory foam mattresses. They range from firm to soft and are designed to fit different sleeping positions. The Amerisleep AS4 is the second-softest mattress they have. It is called “medium-soft” and is made specifically for side sleepers. As a side sleeper, I was very excited to try out the Amerisleep AS4. Is it really a great match for side sleepers? Read on for my full review. You Are A Side Sleeper– On your side, you feel the 4” of foam go to work. This top layer is very soft and, along with the transition foam, it relieves pressure on shoulders and hips. This mattress is designed specifically for side sleepers. You Are A Hot Sleeper– Memory foam is not always the best at keeping you cool, but that is not the case with the AS4. The Celliant cover cools you and the bio-based foam is open-celled for increased breathability. In addition, the transition layer has air channels to cool you even further. You shouldn’t be sleeping hot with the AS4. 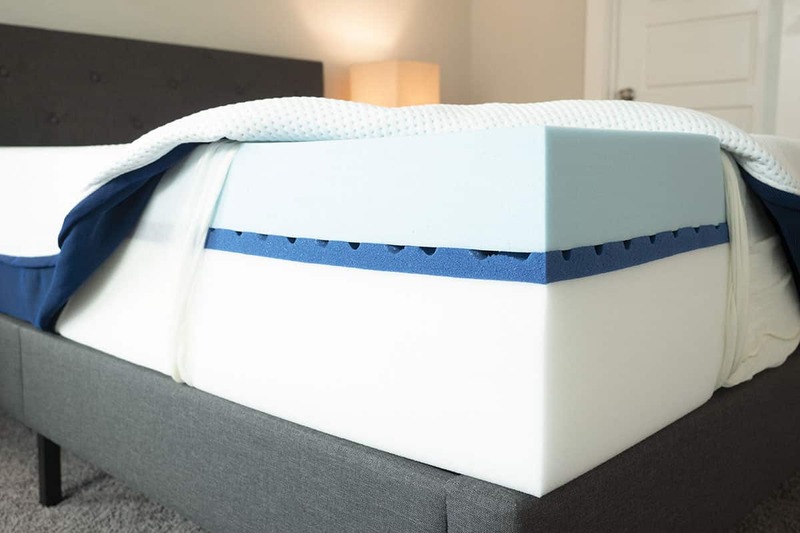 You Want That Classic Memory Foam Feel Without Getting Stuck– The bio foam layer is very responsive, so you shouldn’t feel “stuck.” You get to sink into the mattress, but it is still easy to move around and change positions. You Are A Back or Stomach Sleeper– The AS4 is specifically designed for side sleepers so, if you sleep primarily on your stomach or back, you may not get the proper support with this mattress. If this is the case, I would consider the firmer model in the Amerisleep line. You Don’t Like That Classic Memory Foam Feel– With the AS4, you really get that quicksand, sinking feeling that comes with classic memory foam. If you have had more success with innerspring or latex mattresses, this may not be the best mattress for you. Then you have 4” of a very soft, Bio-Pur foam. It is a bio-based memory foam that is open-celled and is more breathable than normal memory foam. Then you have 1” of an Affinity layer with Surface Modification Technology. It transitions you from the soft upper layers down to the support layers below. It also has air channels, to allow for airflow. In addition, it has “zones” built in to give pressure relief in key areas like shoulders and hips. Finally, you have a 7” Bio-core base support layer. Amerisleep is eco-friendly and Made in the USA. The AS4 is available in Twin, Twin XL, Full, Queen, King, California King, and Split King. The memory foam in this mattress responds quickly, so you shouldn’t feel stuck in the mattress. The Celliant cover promotes cooling, the memory foam is open-celled, and the transition layer helps with airflow. Memory foam mattresses aren’t always the best for sleeping cool. However, on the AS4, you shouldn’t be sleeping hot. The 4” of memory foam make this a good option for side sleepers. It should relieve pressure on shoulders and hips. In addition, the transition layer is designed to help relieve pressure on key areas like the shoulders and hips. The AS4 is also adjustable base friendly. I reviewed the AS4, Amerisleep’s medium-soft model. That being said, the mattress felt like a 5/10 in terms of firmness, softer than average.It is designed for side sleepers. Lying on my side, the pressure relief was great on my shoulders and hips. I pressed down into the 4” of bio foam, but did not hit the firmer layers beneath. On my back, I did feel some support on my hips, but I think a firmer mattress may be needed if you sleep primarily on your back. On my stomach, I definitely needed an extra level of support. The AS4 is quite soft, so I felt my hips sinking in and it wasn’t the most comfortable. If you are a stomach sleeper, I would look at the firmer Amerisleep models such as the AS2 and AS3. The AS4 is an all foam mattress, so I expected it to perform well with motion isolation. During my tests, there was little motion transfer as I moved around the cup. If you sleep with a partner, you shouldn’t feel them moving around too much. This makes the AS4 a good mattress for couples. All-foam mattresses don’t always have the best edge support. Sitting near the edge of the AS4, the mattress did collapse. However, I didn’t feel like I was going to fall off. Also, lying near the edge, I didn’t feel like I was going to be ejected from the bed. Considering this is an all foam mattress, the edge support is decent. You can see the edge support in the photo below. “Normally with a mattress like this, I would press right down through that upper layer down to the firmer layers beneath. I did not have the experience with the Amerisleep. I felt great pressure relief on my shoulders and my hips, when I was lying on my side. On my back, my hips sunk in just a little bit, but I still felt good support. On my stomach, my hips definitely sunk in a little bit too much. If you’re my size and you sleep on your stomach, you might want to look elsewhere. Marten’s experience confirms my opinion that the AS4 could be a great fit for side sleepers of all sizes. Even at his size, he didn’t press down to the firm support layers. Those 4” of bio-foam gave him the necessary pressure relief. If you a side sleeper of most any size, the AS4 should be a good match for you. The 4” of foam and the Affinity transition layer both relieve pressure on your shoulders and hips. This is a great choice if you want to sleep cool. Because of the open-celled bio-foam, the air channels in the transition layer, and the cooling Celliant cover, you won’t be sleeping hot. You get that great memory foam feel without getting stuck. 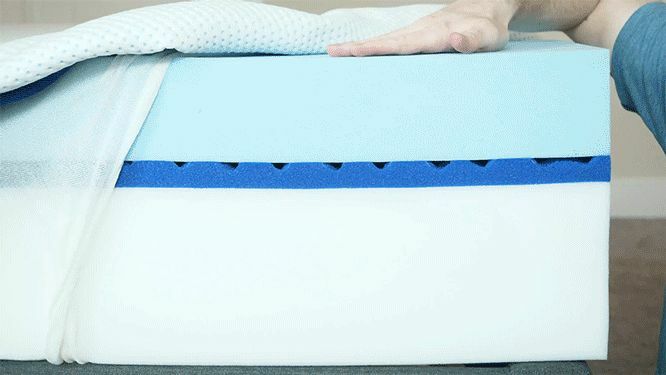 The 4” of soft foam responds very quickly, making it easy to move around on the mattress. The Celliant cover also helps with recovery, so this could be a great mattress for athletes. The Amerisleep AS4 is designed specifically for side sleepers and I can say that it worked very well when I slept in that position. I felt great pressure relief on my shoulders and hips. If you sleep primarily on your back or stomach, I would consider the firmer mattresses in the Amerisleep line. The Amerisleep AS4 is a bed in a box mattress, which means it will come compressed and shipped straight to you. You will want to begin by removing the rolled up Amerisleep AS4 from its box. Then, preferably with another person’s assistance, position the roll on your bed. Carefully cut the away the first layers of plastic until the still-compact mattress can be laid down flat. Then, pierce through the final layer of plastic and the AS4 will expand. Simply clear away the excess plastic and allow your mattress to breathe and fully expand. I found the AS4 to be very comfortable. It is designed for side sleepers, and I can say that the mattress is indeed a great match. That top layer is so soft, I felt nice pressure relief on my shoulders and my hips. If you are primarily a stomach or back sleeper, you may need a firmer mattress to give you the proper support. I would consider the firmer models in the Amerisleep line, such as the AS2 or AS3. All Amerisleep products come with a 100-Night Sleep Trial and 20 Year Warranty. I am a side sleeper with shoulder, neck and hip issues and just returned a purple which didn’t feel supportive at al to my hips. I couldn’t sleep on my side. I am debating between this Amerisleep A4 or a Casper. I tried both in the stores and liked them both! Which would you recommend better? If you liked both, go with your gut! Joe, your reviews are great! I’m a side sleeper with hip pain. Would you recommend the Puffy Lux or the Amerisleep 4? Thanks so much! I don’t have experience with the Puffy Luxe, but I do think the AS4 would be a good fit for you. Hi All- I have an Amerisleep 4 – I have had it for over a year and am happy with it-except it still seems a bit firm to me- What do you recommend as a possible topper to make it a bit softer? Thanks very much. We’re about to start reviewing toppers, so stay tuned. Hi, I am looking for the best mattress with no motion transfer for myself and my husband. That is our number one priority. We are both side sleepers. I’ve been reading your reviews and I’m choosing between the Amerisleep A4 and the Loom and Leaf. Which has less motion transfer but is still comfortable (on the softer side)? Also, are there others that perform even better in motion transfer? Thanks in advance! The AS4 probably has slightly less motion transfer than the L&L. can you use a mattress pad with the amerisleep due to the cover it already has. You can use a mattress pad without any problems. I would get the AS4 if you are a side sleeper. Which did you like better, this the A4, or the Layla mattress? I’m torn between the two. You said that Layla was the most comfortable you’ve ever slept on. According to your cooling score Layla is cooler. Which would you personally pick the AS4 or Layla? AS4 is better for bigger people. I love the memory foam of the Layla but that’s a personal preference thing. I don’t think the differences in breathability are big. You didn’t mention off gassing. I am very sensitive to chemical smells and I currently sleep on a Tempurpedic that I like a lot but it took almost 30 days of off gassing before I was able to use it. It’s very minimal. I don’t think it would be an issue for you. Joe, is there another memory foam mattress you think is better than the A4? We’re looking at this one and the TempurPedic Cloud Supreme but I do wonder if there is anything else? We are side sleepers. It’s a very solid choice for side sleepers, so I don’t think there’s very many at all that I think would be considered better. I live in North Carolina and would like to test an Amerispleep mattress. Is there a store nearby? Unfortunately there isn’t a store in North Carolina. This is not the AS4. It is the old Colonial. They’ve redesigned it and the cover is not the one pictured on your site. Also, it has bio pur not bio pur+ and the AS4 has 4 inches not 2 of it. Please update your review. I’d really like to know the difference in feel, motion transfer and value. I am aware and will be updating the review soon. Thanks. Joe, your reviews are great. If I wanted to become an expert in foam mattresses and some of the B2C startups (e.g. Casper, Leesa) what are some good resources? If I wanted to start my own lower end mass market version do you have any suggestions regarding best foam types for value/price? Thanks. Hi JR – a lot of things to consider! I’d check in with the foam manufacturers (there are only a few major ones behind a lot of the online brand) for material options and tradeoffs. I noticed that you rated the sleeping hot a 4. Does it sleep hotter than others you have tried or does it just sleep hot compared to what it claims with the Celliant infused cover? I don’t have a problem going to sleep for it being too hot but I wake up sweating now with my cheap coil spring mattress I bought a few years back. Also, do you get that enveloped feeling as you do with the tempur-pedic cloud? I’m kinda skeptical since it has such a bounce back characteristic. Thanks! It’s hard to make memory foam not sleep hot, but Amerisleep does a good job. It doesn’t sleep as cool as other materials (latex or gels) generally. I’m waking up very hot on my As4….I am so disapointed! Luckily I have the 100 night trial. My Colonial mattress from Amerisleep is coming on Friday. We had gotten a Saatva Luxury Firm and I’ve never been so uncomfortable on a mattress. It has no give on the top layer and any small movement wiggles the whole mattress waking the other person. I’m just praying that the Colonial will be perfect… Fingers crossed…. Let us know how you like it Claibourne!